(Birmingham, Alabama) - HEALTHSOUTH Lakeshore Rehabilitation Hospital is a top-tier healthcare facility serving north central and central Alabama. 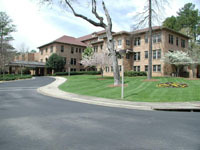 It began as a tuberculosis sanitarium in 1922. However, the operation successfully caught the first wave of demand for rehabilitation institutions that began in the early 1970s. From a facility perspective, additions occurred in 1973 with a major renovation of mechanical, electrical, and plumbing systems in 1983. The first direct digital control system followed in 1987. Today, the campus consists of 8 buildings and nearly 350,000 square feet of controlled space. By 1999, the institution was suffering from the effects of an aging and non-Y2K compliant building controls system as well as rising energy prices. Director of Plant Operations, Tom Bradley, knew that corrective action was required to operate the buildings most efficiently. He called upon a trusted partner in Climate Controls Systems, Inc. (CCSI), an authorized KMC Controls representative who had been involved with Mr. Bradley in previous control and HVAC-related projects. CCSI had earlier established a reputation for quality and integrity with Tom Bradley and now applied their expertise to a controls system upgrade. Start-stop device management, load shedding during peak hours, trending, and reporting were all among the goals to be achieved. With these and other goals in mind, CCSI and Lakeshore chose to install the KMC automation system. Over the next three years, CCSI installed numerous KMC products to include management and terminal unit controllers in all eight of the Lakeshore buildings, keeping pace with continued growth. KMC’s WinControl XL Plus fills the need for operator workstation software. Chillers, boilers, variable frequency drives, central air handling systems, distributed unitary equipment, even the dehumidification of the aquatic facility all fall under the control of the KMC system. During this same time, Tom Bradley was applying common-sense innovation to save energy-related costs. Such actions include the use of an additional, smaller chiller during summertime and employing a gas-fired micro turbine generator to satisfy peak electrical demand (11 AM to 7 PM). Impressively, HEALTHSOUTH Lakeshore Rehabilitation Hospital now operates its facilities for $5000 less in electrical costs per month than it did with lower energy prices.